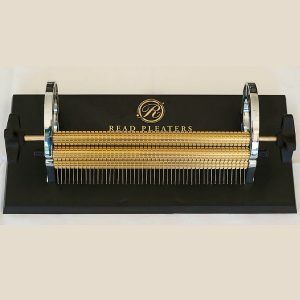 Read Smocking Pleater – 24 Row Regular Pleater – 24 Needles Spaced 1 cms Apart – Suitable For Most Normal Pleating Applications. Features: Heavy-duty stable base-plate with anti-skid rubber feet; Extra large side-plate opening allowing for large capacity of rolled-up fabric; Simple, pin-type roller holding system allows for quick and easy needle access; Comfortable and user-friendly dual handles for maximum versatility; Heavy-duty solid brass rollers; Capable of handling heavy-weight fabrics. 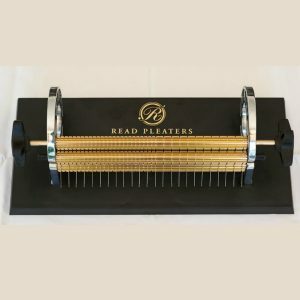 Read Smocking Pleater – 24 Row Maxi Has 0.5cms Spaces Across The Entire Width Of The Roll, Allowing For 47 Needles. Can Also Be Used As A 24 Needle Pleater By Removing All The Half Space Needles. Features: Heavy-duty stable base-plate with anti-skid rubber feet; Extra large side-plate opening allowing for large capacity of rolled-up fabric; Simple, pin-type roller holding system allows for quick and easy needle access; Comfortable and user-friendly dual handles for maximum versatility; Heavy-duty solid brass rollers; Capable of handling heavy-weight fabrics. Read Smocking Pleater – 32 Row. Thirty Two Needles Spaced 1 cms Apart With Half Spaces Across Half Of The Roller Width – Great For Bigger Pleating Projects. 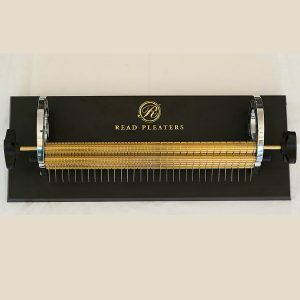 Features: Heavy-duty stable base-plate with anti-skid rubber feet; Extra large side-plate opening allowing for large capacity of rolled-up fabric; Simple, pin-type roller holding system allows for quick and easy needle access; Comfortable and user-friendly dual handles for maximum versatility; Heavy-duty solid brass rollers; Capable of handling heavy-weight fabrics.